Commercialization activity being managed in university tech transfer, corporate engagement, and sponsored research offices runs a significant risk of running afoul of tax exemption statutes – and that can create a compliance nightmare for your university and severe headaches for you. 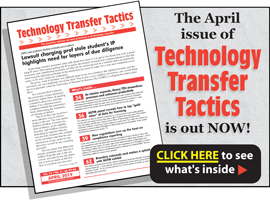 That’s why Technology Transfer Tactics, in partnership with Industry-Sponsored Research Management, is sponsoring this critical webinar: Preventing Tax Compliance Nightmares in University Tech Transfer and Industry-Sponsored Research. This session, scheduled for December 12, will address common tax issues associated with university research commercialization efforts, offering practical guidance from a seasoned university tax director, including a real-world case study of tax challenges faced by a major research institution. You will leave this program with a thorough understanding of the tax issues that affect technology transfer and other research commercialization activities – and gain a full appreciation for the impact these issues can have on an institution when not managed appropriately. Plus, you’ll take home compliance guidance and strategies you can use to ensure you steer clear of common tax problems and complications.